Please note: We do not yet have in stock power cords for those outside the US/Canadian market. We will be stocking the power cords for markets that utilize the "Europlug" and "Type G" power sockets shortly. 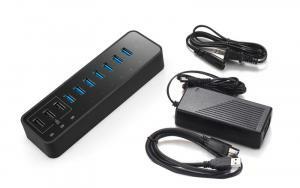 Boasting 7 USB 3.0 Ports and 3 Fast Charging Ports, this 10-Port 60W USB 3.0 Hub is built for serious duty. 3 fast charging ports detect your device to deliver one of its fastest possible charge up to 2.1 amps per port, while the remaining 7 ports charge at speeds of up to 0.9 amps each. Wondering what distributions and versions this USB hub will work with? The answer is it will work with any and all operating systems and distributions! Europe, South America, Africa, Asia, Mexico, Russia, Greenland, Iceland, New Zealand, Japan, India, Pakistan, Iran, the Pacific Islands, any other islands, and the middle east. Is the computer at a bit of a distance from where you want to be plugging in devices? Get a longer USB cable! We stock high quality USB 3.0 cables. Cables greater than 2.6ft not available with "standard shipping" option. USPS, DHL, or UPS required.